As you can see above, we have added an LE/Insider Access Menu to the TWIP website! This was launched previously as part of our Patreon page, but we have now incorporated it into the This Week in Pinball website. 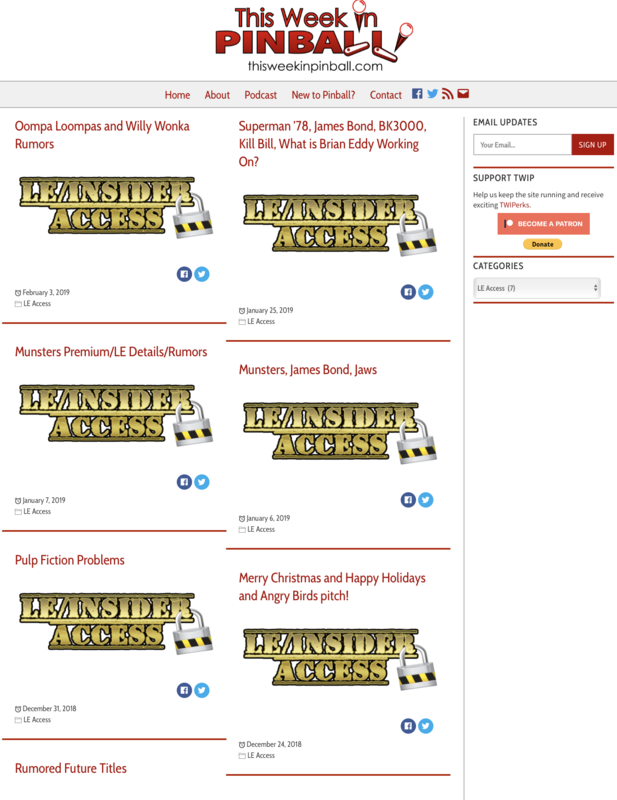 You can see all the recent Insider correspondence on the LE Access page here! See below for general information about the LE/Insider Access, and please email me at thisweekinpinball@gmail.com with any questions you have. Before diving into the LE/Insider Access, a HUGE thank you to our monthly subscribers (at ANY LEVEL), you all are the reason This Week in Pinball is still going! Why launch the TWIP LE/Insider Access? To help keep the TWIP website sustainable. I love pinball and love doing This Week in Pinball. I spend most of my free time working on TWIP. In order to keep this up I am trying to increase the number of financial supporters. Thank you for your consideration fellow pinheads! I truly truly appreciate all of you that read and support TWIP! What is the TWIP LE/Insider Access? Why don’t you just report these rumors/information/speculation on TWIP? We try to be as responsible as possible with the information we report on TWIP. We do have to report on rumors sometimes as manufacturers don’t typically confirm rumors, even if it is the “worst kept secret in pinball”. For example, we literally saw Munsters on the production line at Stern before Stern confirmed Munsters as an upcoming title. That being said, we don’t want to just throw out rumors irresponsibly either. If a rumor appears on TWIP, we are fairly confident it is accurate. If we hear the Stern obtained the license to Jaws, but it was from a source that is only correct 30% of the time, should we include that on TWIP as a viable rumor? Rumors in #1 will usually go on TWIP. Rumors between #1 and #2 will be included in the LE/Insider Info. Rumors in #3 will go no where, unless we’ve heard it from multiple separate sources, then it may go in the LE/Insider Info. Please Note: As is TWIP’s policy, NOTHING – no rumors/speculation/information will ever be shared without permission from the source. What is to stop someone from sharing the LE/Insider information with others? We ask that the LE/Insider information is not shared or forwarded to anyone, on any forums, or on podcasts. If it is shared, that person’s subscription will be cancelled going forward and they will no longer have access to the weekly(ish) updates. The information we share is special and for your eyes only! You must be a supporter for at least three months in a row to be eligible for TWIP swag. It is ordered around the time of the holiday season. You can also sign using PayPal using the button below, and you will receive all the same benefits as the Patreon tiers. If you sign up via PayPal for the LE Access, the information will be emailed to you (as opposed to you reading it on the TWIP LE Access page). Thank you for your consideration and for reading This Week in Pinball! Previous Previous post: January Giveaway Winners, February Pinball Giveaways Announced – Enter Now!